It was a gorgeous late summer day. I was with the family and we were having a great time camping,fishing and spending quality time. My wife is becoming quite the fisher woman and after many steelhead on a single hand rod on the North Umpqua, she has taken up the two handed rod and has started to master it. She knows the runs and the technique and needs little hand holding ( just ask her). Sometimes I get a little too vocal when I see her miss an anchor placement or stop her rod too low. She does best when I shut up and leave her alone! I'm slowly learning! I knew she did not need me to show her anything about the run so I concentrated on my son and made sure he was set up in a spot he could cast in without being swept away,and might have a chance at a fish. I put him up in the head of the run and showed him where the fish usually lay and what he needed to do to get a good swing through the bucket. He listened intently and I could see the wheels turning hard in his head. Once I knew he was in a safe spot, I wanted to leave him on his own. As I was walking away he said "Hey Dad!" He then flips his hat around backwards on his head, flashes me the shaka brah "hang loose" hand sign and says "Old School Baby!" I laughed hard and walked away shaking my head, what a crack up! "I got one, I got one!" He's yelling, we are yelling, the dog is barking, the reel is screaming and we are all on instant high alert. I run from the lower end of the pool upriver towards him as I yell "keep the rod up, keep it tight, let um run if he wants!" and other unintelligible gibberish as my mind is blown that he has actually hooked a fish. The reel pays out line fast and bucks hard as the fish dogs around on the ledge on the far side of the run. I can tell by the way its fighting its a big buck. We never see the fish as it stays deep and swims where it wants, barely aware of the hook in it's mouth. It would swim upstream as my boy continues pulling as hard as he dare on the 10lb Maxima. We scramble down stream and I have a hand on the back of his waders ensuring he doesn't go down in the swift water. "You are doing great son, lets move down a little and get an angle on him and see if we can land him"
We move down stream, straight across from the fish and all the while he is pulling hard on it trying to move it off the ledge on the far side. He gains line onto the reel a little then looses it in the deep, rod bending slow run of a large fish. Its been a few minutes now and we are in a stand off. Every one is yelling and the excitement is high. Mom makes it up where we are and shouts encouragement as I spy a tear of joy in her eye as she is hit with the overwhelming weight of the river tradition that is being transferred from father to son at this very moment. My daughter joins in shouting and screaming at her bro as he fights his first fish. " Don't jack it up" she yells ribbing him mercilessly. We all are still amazed at what has happened and time stands still as we all realize, Wow dude, you are really hooked up! The dog is going bananas as he knows what each of my reels sound like, the Daiwa 812 purrs and functions flawlessly. as K2 fights the fish hard and perfectly, never giving slack to the line and always having a good rod position. I am snapped back to reality knowing I can't do that. It was HIS cast, HIS drift and HIS hookup, it's HIS fish, lay off you knuckle head DON'T TOUCH THE ROD! I resist the urge knowing what ever happens will happen. I continue to try and relay information on how to fight this fish, telling him about rod position and side pressure, trying to get the fish to roll or turn by pulling on him at different angles. He pulls the fish away from the ledge, the fish swims right back over and hunkers down. Again and again this game is played out until..........the hook comes out and the fish is gone. Now we all wanted to see this fish but it was not to be this time. I tell K2 that almost no one lands their first steelhead. He understands and is ready to catch another one almost immediately. The awesomeness factor on this experience was off the chart, landed or not this was a big deal for everyone. 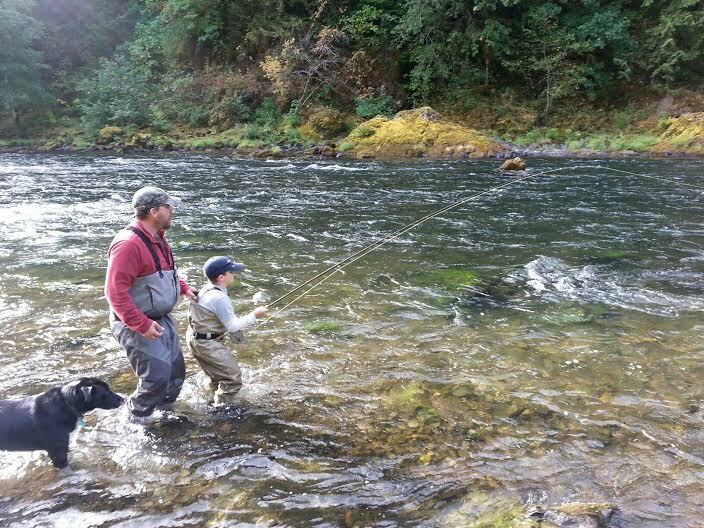 His whole family got to witness his first fish on the North Umpqua. To say I am proud at his accomplishments thus far in his young career are an understatement. Awesome post Mark! Congratulations to Karsten on his first steelhead hooked and to dad for being a great guide. You are so blessed that your entire family enjoys being on the river so much. Such a great thing to share and pass on. I remember visiting with you and Karsten at camp and when I asked how it felt to hook into his first steelhead and he told me "my legs were shaking!!!" Way to go with being a Godly leader of your family. Cool story! Congrats Karsten and mark! Hope to see you on the river one day! Way to go Karsten! The picture of you holding on to the back of his waders cracks me up...pretty sure you've kept me from a swim or two with the same technique! High five to Karsten and the Stangeland clan!